A 30-pound cat left at a shelter in Canada late last year is helping others — and not just fellow felines. The feline was left at the Fredericton SPCA in a box that was taped shut. Merry Christmas: Tiny was left at the SPCA inside a box that was tape-sealed shut. The cat, named Tiny, has become something of an Internet sensation: he has more than 2,100 friends on his Facebook page, named Tiny’s Weight Loss Challenge, which has also pulled in more than $2,000 in donations. Proceeds will be used for animal surgeries at the shelter, and give extra care to animals with special needs. Tiny, now living in a foster home, is on a special food diet that includes lots of exercise. 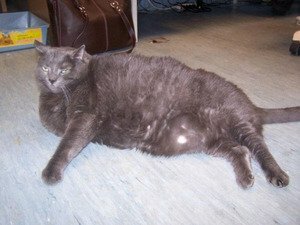 Such a high body weight is unhealthy for cats, as it can lead to a host of health problems, including arthritis and diabetes, and the feline is also so obese that he’s unable to fully clean himself. To date, Tiny has lost approximately five pounds; his ultimate goal is to slim down to 20 pounds in the next 12 months, and all progress is recorded on the cat’s Facebook page. But Tiny has done more than become a money magnet; he has motivated volunteers and other staff members at the shelter to stick with their own weight-loss plans, especially those who have gone back on their New Year’s resolutions.